While the NHL Rookie Tournament is an annual tradition, getting excited about Montreal Canadiens prospects is year-round affair. The 23-man Montreal Canadiens roster for the event taking place from September 8-10 has been announced, but there are several names that stand out above the rest. Here are the top five for which to keep an eye out. 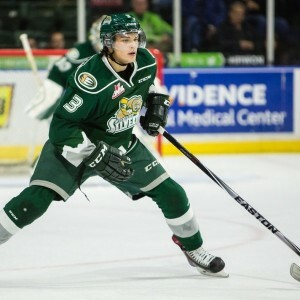 In the eyes of many, forward Jeremiah Addison’s admittedly slim chances of making the NHL improved significantly with an impressive showing at the Memorial Cup this past spring. Scoring five times (and adding one assist) in four games for the Windsor Spitfires, the championship-winning forward finished tied for second in goals during the tournament (right behind Arizona Coyotes top prospect Dylan Strome). Considering he failed to average a point per game during any one regular season, it’s hard to envision him as anything other than a depth forward at this juncture. He’s certainly hard to root against though as a seventh-round pick (2015) who brings not just leadership intangibles, but proven scoring ability too. 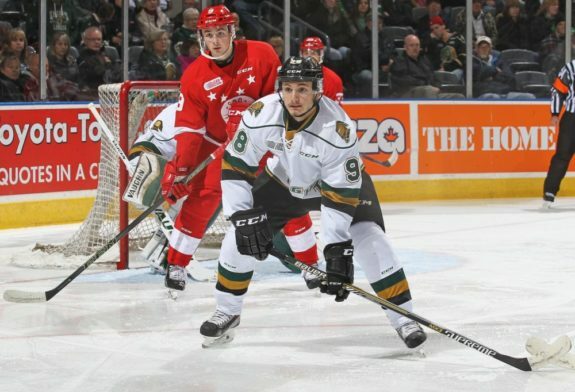 His London Knights teammate Olli Juolevi is the one who’s received much of the accolades, going fifth overall in 2016, but it’s Victor Mete who scored more points (and goals) this past season, in eight fewer games no less. In fact, Mete was the top-scoring defenseman altogether on their junior squad this past season and one can’t help but wonder if Mete’s 5’10” frame and general lack of size (180 pounds) contributed to him getting selected in the fourth round last year. In a pipeline largely devoid of defensive (or any) prospects, Mete is one player with significant upside who’s worth watching. The Ontario Hockey League’s top goalie for 2016-17, Michael McNiven is the first of two names on this list making a reappearance relative to a few months ago, from the Habs’ development camp. McNiven wasn’t drafted, but was instead signed as a free agent prior to training camp in 2015, which shouldn’t be cause for concern. Goalies tend to develop at a different pace relative to players at other positions and many get passed over early in drafts (or in McNiven’s case, altogether). It was the same story for the reigning (two-time) Vezina Trophy winner, Sergei Bobrovsky. Washington Capitals goalie Braden Holtby went in Round 4 (2008). New York Rangers goalie Henrik Lundqvist went in Round 7 (2000). Ex-Boston Bruins goalie Tim Thomas went in Round 9 (1994). And current-Anaheim Ducks goalie Ryan Miller went in Round 5 (1998). In fact, only two of the last nine trophies went to first-round picks: Bruin Tuukka Rask, and, well, you know who else. Obviously, McNiven has a long way to go before being realistically compared to Carey Price, but it’s good to know his draft pedigree shouldn’t get in the way. Noah Juulsen is the other prospect making a second appearance, here as the best bet among defensemen to make the Canadiens this coming season. Of course, that doesn’t really mean all that much, considering there’s not really a roster spot up for grabs, nor is Juulsen actually ready to make the leap to the NHL by all accounts. It doesn’t change the fact that Juulsen is the team’s top defensive prospect right now, with Mikhail Sergachev having been traded to the Tampa Bay Lightning. Set to turn pro after getting in a couple playoff games with the St. John’s IceCaps, he’ll have to settle for the Laval Rocket, with the franchise having just moved. The good news is Habs fans in Montreal won’t have to travel nearly as far to catch a glimpse of him (and potentially McNiven) in American Hockey League action this coming season. Consider the upcoming tournament a sneak preview. The situation was so dire that his participation at this year’s tournament is being seen as a comeback attempt. That’s almost odd to say, because, as a fourth-round pick in the Habs’ strong 2013 NHL Entry Draft (which produced Michael McCarron, Artturi Lehkonen and Sven Andrighetto), Reway is just 22 years old. It’s safe to say he’s not taking his youth for granted at this point. He’s also a talent not to be taken lightly.